This is a difficult book to rate because of its content and the tone in which the story is presented. The story is about a walk that occurs every year and consists of 100 young boys. The point of the walk is merely to survive. Each boy must keep a pace of 4 miles per hour or else they receive a warning; three warnings and you are shot. The walk ends with the last boy standing who is then received a Prize of whatever he wishes for the rest of his life. King chooses to focus primarily on one boy, Garrity, and his interactions with the other walkers. King also writes in an almost brutal tone. He doesn't sugarcoat anything that happens, he just writes it and moves on to the next point which I thought was the most disturbing part of the book. Readers aren't given time to recover as walkers are shot, some with a lot of detail. I had to stop reading a few times and take my mind off the book for a little while, but I always ended up wanting to keep reading and find out who the last walker standing ends up being. 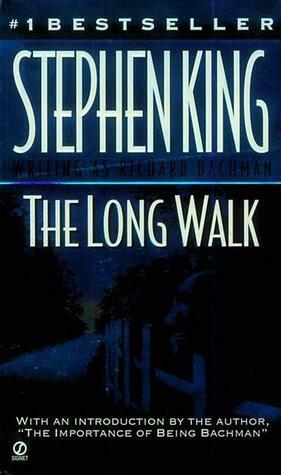 Stephen King knows how to draw the reader into the story while at the same time causing them to push back a little at the disturbing topics he presents. I am really glad I chose this as my first King read and I will definitely be reading more of his books. I might recommend the book, but really only for those who enjoy more "serious" reads and can handle the bluntness of his writing style.